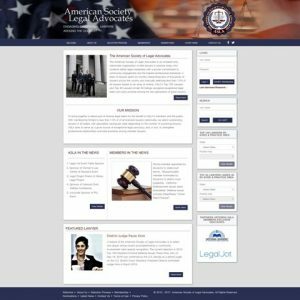 The American Society of Legal Advocates came to us with an interest in having a membership website developed for a new venture they were starting. We started the project by having our design team create a custom concept for their vision of the website. We then started building the website within the WordPress Content Management System so the client would be able to easily manage and update the website as needed. We developed the website utilizing Responsive Web Design to insure that the website displays properly on any device and in any browser. We also incorporated a membership module plugin into the website and made many tweaks and programming modifications to the coding to change the core functionality and provide additional features that the client wanted. Next we optimized the coding to make the website perform better and pages load as quickly as possible, as can be seen in the screen capture of a GT Metrix performance report on the American Society of Legal Advocates website below. The end result is that our client is pleased with the website and Dallas Website Design, has acquired many paying members, and ranks highly in the Search Engines.